The nine arrests signal, once again, that anyone who criticizes the Ethiopian government will be silenced. The timing of the arrests – just days before the US secretary of state’s visit – speaks volumes about Ethiopia’s disregard for free speech. (Nairobi) – The Ethiopian authorities should immediately release six bloggers and three journalists arrested on April 25 and 26, 2014, unless credible charges are promptly brought. United States Secretary of State John Kerry, who is scheduled to visit Ethiopia beginning April 29, should urge Ethiopian officials to unconditionally release all activists and journalists who have been arbitrarily detained or convicted in unfair trials. The arrests also came days before Ethiopia is scheduled to have its human rights record assessed at the United Nations Human Rights Council’s universal periodic review in Geneva on May 6. On the afternoon of April 25, police in uniform and civilian clothes conducted what appeared to be a coordinated operation of near-simultaneous arrests. Six members of a group known as the “Zone9” bloggers – Befekadu Hailu, Atnaf Berahane, Natnael Feleke, Mahlet Fantahun, Zelalem Kibret, and Abel Wabela – were arrested at their offices and in the streets. Tesfalem Weldeyes, a freelance journalist, was also arrested during the operation. Edom Kassaye, a second freelance journalist, was arrested on either April 25 or 26; the circumstances of her arrest are unclear but all eight individuals were apparently taken to Maekelawi Police Station, the federal detention center in Addis Ababa, the capital. The police searched the bloggers and journalists’ offices and homes, reportedly with search warrants, and confiscated private laptops and literature. On April 26, another journalist, Asmamaw Hailegeorgis of Addis Guday newspaper, was also arrested and is reportedly detained in Maekelawi. The detainees are currently being held incommunicado. On the morning of April 26, relatives were denied access to the detainees by Maekelawi guards, and only allowed to deposit food. Human Rights Watch released a report in October 2013 documenting serious human rights abuses, including torture and other ill-treatment,unlawful interrogation tactics, and poor detention conditions in Maekelawi against political detainees, including journalists. Detainees at Maekelawi are seldom granted access to legal counsel or their relatives during the initial investigation phase. The Zone9 bloggers have faced increasing harassment by the authorities over the last six months. Sources told Human Rights Watch that one of the bloggers and one of the journalists have been regularly approached, including at home, by alleged intelligence agents and asked about the work of the group and their alleged links to political opposition parties and human rights groups. The blogger was asked a week before their arrest of the names and personal information of all the Zone9 members. The arrests on April 25, 2014, came two days after Zone9 posted a statement on social media saying they planned to increase their activism after a period of laying low because of ongoing intimidation. A Human Rights Watch report in March described the technologies used by the Ethiopian government to conduct surveillance of perceived political opponents, activists, and journalists inside the country and among the diaspora. 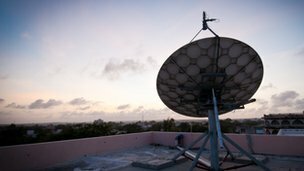 It highlights how the government’s monopoly over all mobile and Internet services through its sole, state-owned telecom operator, Ethio Telecom, facilitates abuse of surveillance powers. Kerry is scheduled to meet with Prime Minister Hailemariam Desalegn and Foreign Minister Tedros Adhanom in Addis Ababa “to discuss efforts to advance peace and democracy in the region.” Kerry should strongly urge the Ethiopian government to end arbitrary arrests, release all activists and journalists unjustly detained or convicted, and promptly amend draconian laws on freedom of association and terrorism that have frequently been used to justify arbitrary arrests and political prosecutions. The Obama administration has said very little about the need for human rights reforms in Ethiopia. The African Freedom of Expression Exchange (AFEX), a continental body of African free expression organizations, condemned the 27-year sentence imposed by Ethiopia on veteran Somali journalist, Mohamed Aweys Mudey. Ethiopian prosecutors accused Mudey of having information about Al-Shabab operations in Ethiopia and charged him with participating in terror activities. Mudey, who was persecuted under Ethiopia's anti-terror law, was arrested in Addis Ababa in November 2013. The repressive anti-terrorism law, adopted in 2009, is a threat that continues to hang over journalists, forcing them to censor themselves. Opposition says the government has been criminalizing Ethiopians who express their opinions about government policies ever since. They also say Addis Ababa must clarify its broad definition of terrorism. However, the government says the opposition is seeking to glorify convicted terrorists and is “downplaying the danger” Ethiopia is facing as a result of terrorism. According to the New York-based independent Committee to Protect Journalists, over ten journalists have been charged under the anti-terrorism law. 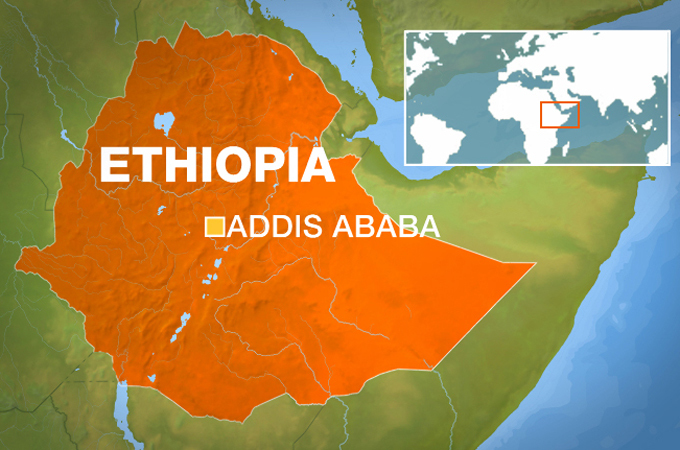 The committee says Ethiopia has the highest number of exiled journalists in the world. Human rights groups accuse Ethiopia’s government of using the country’s anti-terrorism legislation to end peaceful dissent. The Ethiopian constitution, however, guarantees the right to freedom of expression. Qatar Boycott May Mean The End For Al Jazeera: Here's Their Controversial Beginning - YouTube: " "
March 16, 2014 marked the 1,000th day of imprisonment for Ethiopian journalistReeyot Alemu. She is serving a five-year sentence after she was found guilty on terrorism charges in January 2012. 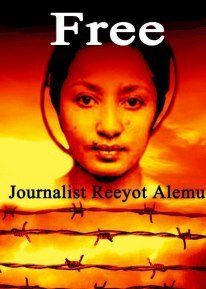 Jailed Ethiopian journalist Reeyot Alemu. Photo via Facebook page of Free Reyoot Alemu campaign. Reeyot, an English teacher, is the recipient of the UNESCO-Guillermo Cano World Press Freedom Prize, the Hellman/Hammett award, and the International Women's Media Foundation Courage in Journalism Award. According to the Committee to Protect Journalists (CPJ), the Ethiopian government has convicted 11 independent journalists and bloggers including Reeyot and Eskinder Nega under a sweeping anti-terrorism law since 2011. Among those jailed are two Swedish journalists who are serving an 11-year sentence for allegedly supporting an ethnic Somali rebel group.